This is one of the poems published in the single collection of verse (1824) which appeared in Johann Mayrhofer’s lifetime. 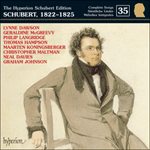 This slim volume was available to subscribers only, and Schubert was not one of these. 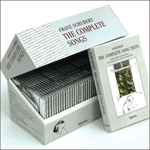 But he must have borrowed a copy from friends, and here he found four lyrics which awoke his old admiration and empathy for the poetry of his former friend: these were Der Sieg, Abendstern, Auflösung and Gondelfahrer in two settings—the solo version is on Volume 15 of the Hyperion Schubert Edition. ‘Former friends’ is a sad epithet for two people who had meant so much to each other; although we do not know the exact state of the relationship of composer and poet in 1824, it had certainly seen better times. The poet had been the nearest thing that Schubert had to an intellectual mentor; nine years older, it was he who introduced Schubert to much great literature and an awareness of the classics. The two had known each other since 1814 (the date of Schubert’s first Mayrhofer setting, Am See) and they had shared a room from the autumn of 1818 to the end of 1820, the longest time that the composer stayed anywhere other than the parental home. But Schubert, as he grew older, needed a measure of independence, and the poet almost certainly attempted to control too many aspects of his protégé’s life. Schubert moved out of Mayrhofer’s tiny room in order to live on his own for the first time, at the age of 24. After this there was an important group of Mayrhofer settings composed in 1822 (Nachtviolen, Aus Heliopolis I and II and Lied eines Schiffers an die Dioskuren), but in terms of personal contact the name Mayrhofer all but disappears from the annals of the composer’s story. It was the loose living of the heady years of 1821 to 1823 under the influence of Schubert’s sybaritic friend Franz von Schober which led to the disaster of the composer’s illness. We may be sure that Mayrhofer had profoundly disapproved of this new direction in Schubert’s life. There was eventually a rapprochement of which we know nothing, and Mayrhofer’s name appears spasmodically in the later 1820s as an occasional guest at Schubertiads. But the old intimacy was gone forever. There is no hint of this dark cloud in this enchanting music, poetry which Schubert set simply because he liked it—not (as one suspects with some of the Bruchmann settings) because friendship required it. The solo setting is cast as a barcarolle in 6/8; in that gliding and lilting nocturne we sense the romantic mystery of Venice. Visitors to this city know how peculiarly ghostly it can seem, the spirits of the past almost palpable in the dark alleyways between narrow canals. There is a sensual undertow and a sense of expectation in this music, adventure in the air, which puts us in mind of Schumann’s Venetian songs (from Myrthen). This quartet on the other hand is quite different—more open, less private, but no less enchanting. Communal music-making implies a ‘night out with the boys’ rather than a secretly hatched plot involving all the sexual skulduggery for which Venice is famous; but this is a night out, starlit and romantic, with singers of sensitivity and poetic spirit, jolly enough to enjoy more than one glass of sparkling prosecco. Unlike many of the vocal quartets for this medium there is no final rousing peroration, music to stir the spirit of lager louts, a style which Schubert in party mood can also embrace with the best of them (e.g. Lied eines Kriegers and Bootgesang). The words begin with ‘Es tanzen Mond und Sterne’. It is the word ‘Sterne’ (stars) which initiates a delightful touch, a graceful little roulade consisting of four dancing semiquavers which suddenly invades the top vocal line. This is like a tiny explosion of melismatic nonchalance, a wink-in-sound of the kind which so often enlivens the music of Chabrier. This motif is more than ornamentation however; it is part of a delightfully spun melody—one of those carefree Schubertian miracles where we feel that all’s well with the world. (Another song which has the same effect on the listener is Der Einsame where the four-semiquaver motif is the friendly flickering of the flame on the hearth.) This little motif also perfectly encapsulates the mystery and intrigue of the phrase ‘den flücht’gen Geisterreih’n’. The expressive harmonic squeeze on the word ‘Erdensorgen’ is another delight of the first verse. So enraptured is the composer with these words that he immediately repeats them; here the second tenor is allowed a stab at the semiquavers motif, and the phrase is lobbed back and forth between him and the first tenor. The undulations in the music and these little ruffles on its surface tell us, even before the words of the second verse confirm it, that we are drifting in a boat, probably a gondola, which rocks gently up and down in the swell of the current. The music for the section beginning ‘Du kannst in Mondesstrahlen’ was clearly conceived by a composer who had written Auf dem Wasser zu singen the year before. There cascading semiquavers had been a dialogue between voice and piano, here between first and second tenor in hocketing thirds. The harmonic foundation here is a simple one: we have moved to the subdominant (G major) and these enchanting flurries alternate between this key and its dominant seventh on D. Once again the strophe is repeated to elongate the musical delight, and once again Schubert pleases himself with various subtle variations in the interplay between the two top lines of the vocal score. When it comes to depict the striking of St Mark’s, Schubert does exactly the same as he had done for the solo setting: he moves a semitone up from the dominant (G) to A flat major, the key with the Neapolitan relationship to the home tonality of C. Perhaps he thought that ‘Neapolitan’ was as near as musical terminology allowed him to ‘Venetian’—at least Naples is in the same peninsula; in any case the effect of this shift is suitably mysterious. In both songs the tower of St Mark’s is allowed to strike within six repeated bars grounded in A flat major harmony, a moment of harmonic repose in the music. In the solo version we hear the clock strike twelve, twice per bar; in the choral version the effect is less literal because it is impossible to subdivide a bar neatly into two in the time-signature of 3/4. Instead there is a curious syncopation in the piano writing, a two-note chime unevenly spaced, a detail that does not matter in the slightest in the context of the music. We are ravished by the slide back to C major for the atmospheric ‘sie schlummern friedlich’. The composer does not use all the words of this third strophe again, the striking of midnight can happen only once per song. Swooning elaborations on the last two lines of the verse continue to work their magic, for here it is not snoring that is depicted, but rather the flickering of happy dreams. The best effect of all is reserved for the very last two repetitions of ‘und nur der Schiffer wacht’. For once the vocal line abandons its contrapuntal exchanges in semiquavers in favour of closer harmonies in slower note values. The sweet yet mournful chords evoke a gondolier’s warning call (‘Aou’! Stagando Aou’!’) across the watery expanses of the lagoon, a magically poetic coda worthy of this perfect little masterpiece. Venice must have been one of the cities that Schubert hoped to see for himself one day. As an Austrian patriot in the wake of the Napoleonic wars he would have regarded it as his own country’s southernmost seaboard, part of the spoils of the Congress of Vienna and the break-up of the French Empire. (Venice remained in Austrian hands into the middle of the next century.) Schubert’s friend and admirer, the poet Ladislaus Pyrker, was the Patriarch of Venice (from 1820) and in charge of many far-reaching reforms in the city. If Schubert had visited the city he would done so under Pyrker’s patronage and would have been made much of. But then, this is one of the many might-have-beens in a tragically short life. Wiegt dich des Meeres Schooss. you are rocked on the bosom of the sea.